You can create maps in Tableau Desktop that show ratio or aggregated data, similar to the example below. These types of maps are called choropleth maps, or filled maps. Choropleth maps are best for showing ratio or aggregated data for polygons. These polygons can be counties, regions, states, or any area or region that can be geocoded in Tableau. They can even be custom territories created in Tableau. For more information, see Create Territories on a Map . 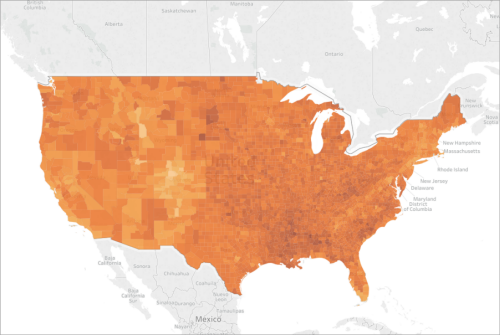 This topic illustrates how to create a choropleth map using an example. Follow the example below to learn how to set up your data source, and build the view for a choropleth map. Location names (if recognized by Tableau), or custom polygons. For more information, see Create Tableau Maps from Spatial Files. The following table is a snippet of the countyObesity + (Obesity_State_County) data source, which is included in the Create Choropleth Maps in Tableau Example Workbook on Tableau Public. 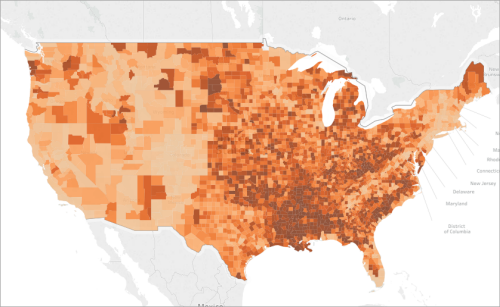 It contains columns for State, County, and Obesity Percent - 2012. 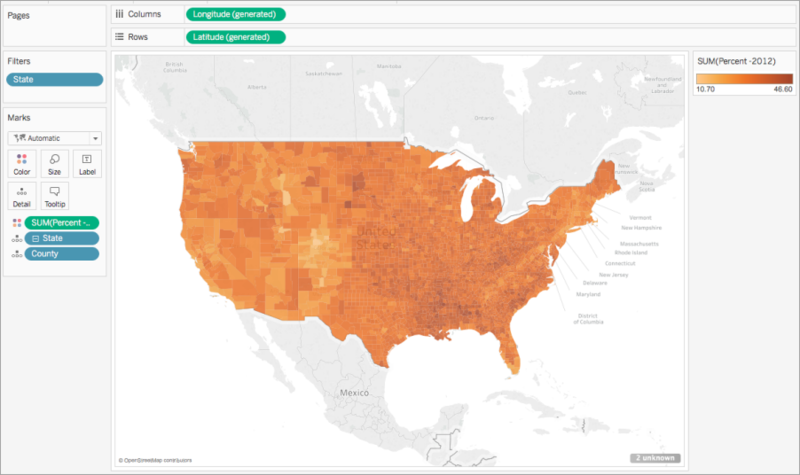 To follow along with this example, download the Create Choropleth Maps in Tableau Example Workbook from Tableau Public, and open it in Tableau Desktop. In the Data pane, under Dimensions, state_Obesity, double-click State. State is added to Detail on the Marks card and Longitude and Latitude are added to the Columns and Rows shelves. 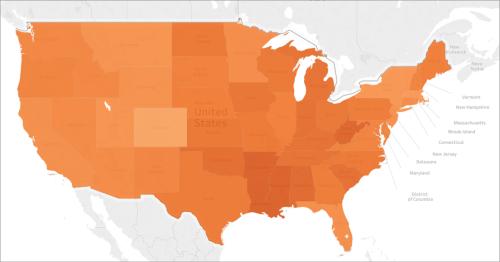 A map view is created with a data point for each state in your data source. 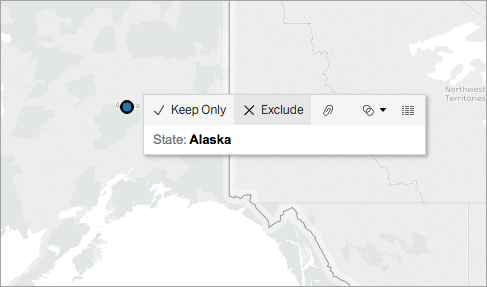 In the map view, select the Alaska and Hawaii data points, and then click Exclude on the tooltip that appears. On the Marks card, click the plus icon on the State field to drill down to the County level of detail. There is now a data point for every county in your data source. From Measures, under countyObesity, drag Percent-2012 to Color on the Marks card. The map view changes to a filled map mark type and the polygons are colored green. Note that the default aggregation for the Percent-2012 measure is SUM by default. On the Marks card, right-click the Percent-2012 field and select Attribute. Since the data in this field is already a percentage, it does not make sense to aggregate it as a sum. 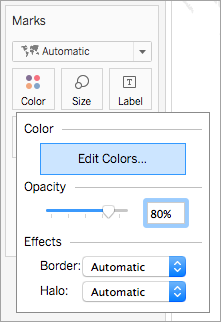 On the Marks card, click Color and select Edit Colors. 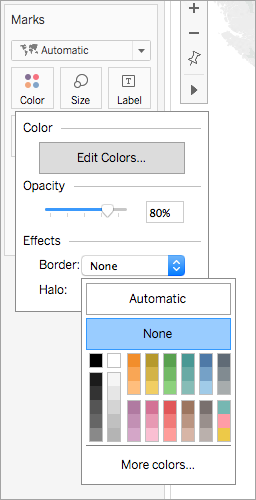 In the Edit Color dialog box, click the color drop-down, select Orange, and then click OK.
On the Marks card, click Color and then, under Effects, click the Border drop-down and select None. You now choropleth map is now complete. There is an obesity percentage for each polygon (county) on the map view. Notice how the high obesity rates in the South are more visible when you use quartiles? The color distribution you choose depends on the information you're trying to show. For example, if you wanted to show that obesity rates are higher in the South, you might choose the quartile example. However, if you want to show that obesity rates are high in the United States in general, you might choose the first example, which distributed color evenly. Neither map is right or wrong; they just tell different stories. The level of detail you specify in a choropleth map determines the patterns you want to see in the data. If you want to see a simplified pattern, consider aggregating up to a higher level of detail. If you want to dig in to find smaller trends, consider aggregating down to a lower level of detail. For example, the map view you created in the Build the map view section was aggregated at the County level of detail. The county level of detail was the lowest level of detail in the data source. At a higher level of detail, such as the State level, the map view might look similar to the following. Notice that the patterns in the data are simplified at this level of detail.